For this week’s Phoneography Challenge, ‘My Neighbourhood’, I’ve decided to share with you the cafes in which I most commonly write. So I’ve spent all week taking photos — plus included one or two I’d previously taken (on my phone of course!). My criteria for cafes to write in are: good coffee, nice ambiance and space. 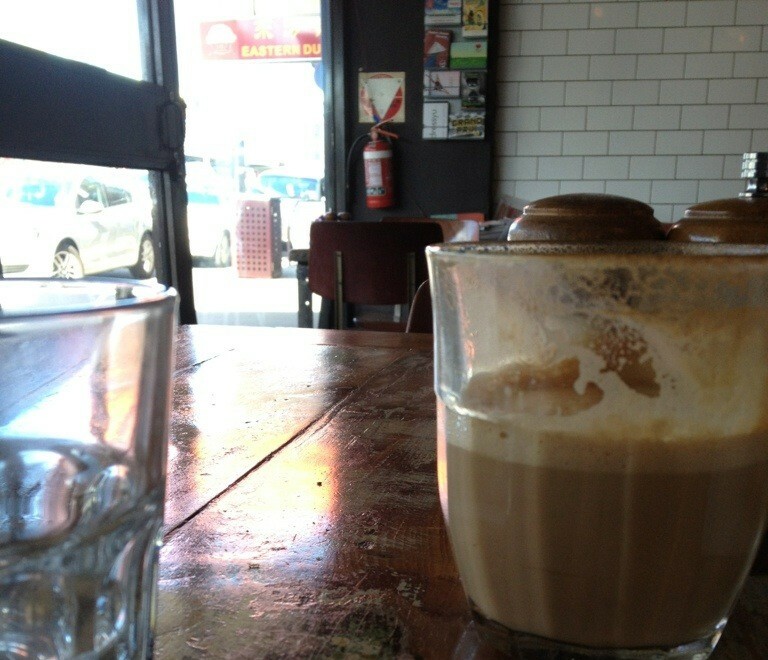 I don’t want to feel as though I’m hogging a table, so if it’s a busier cafe, I’ll choose a quieter time. 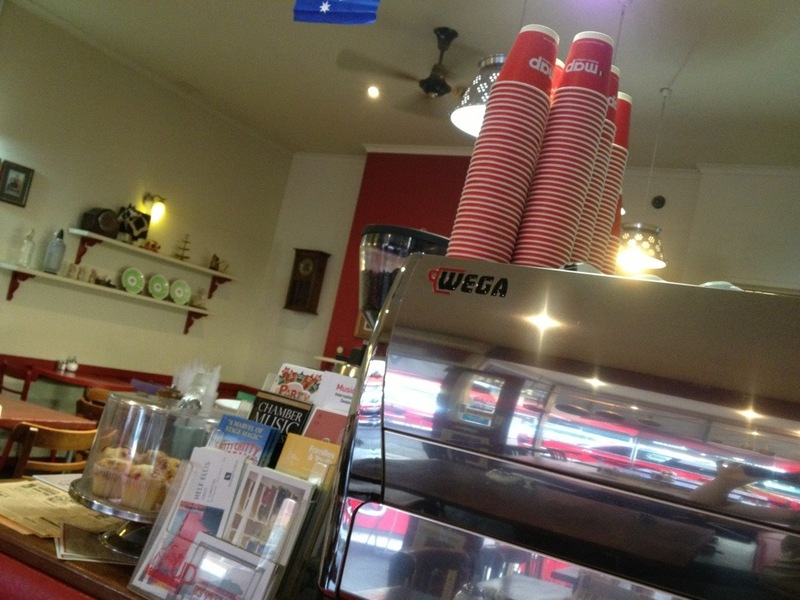 Usually, I’ll order at least two coffees or have a meal, just to say “thanks for having me”. OK, now for the photos! 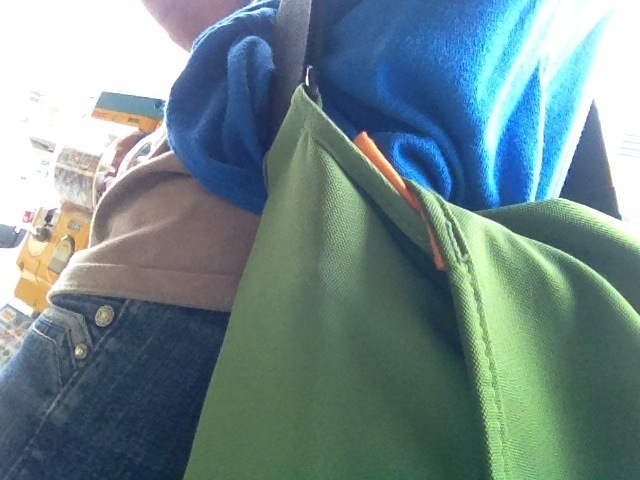 First, this is my Green Bag — my mobile office, really. It contains: my netbook computer, writing journal, highlighters, post-it tabs, pens… All I need for a productive writing session! Since I walk to all the cafes, my bag needs to be comfy to wear — it’s an Australian brand called Crumpler and the style is ‘The Considerable Embarrassment’. Below is Cafe #1, where I most often meet a couple of my writing buddies… It has great coffee — plus, as an added bonus, it’s licensed for the times we do those all-day sessions! Wine o’clock is generally sometime after 2pm. It makes me feel as though I’m “renting” the table. And sometimes it helps the words flow too. A cafe with great coffee AND wine — what more could you want? 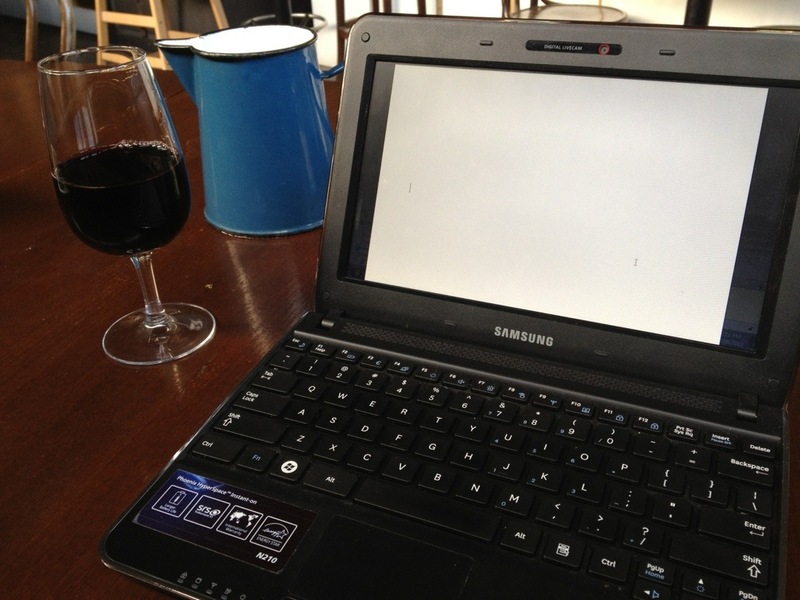 My trusty Samsung netbook at wine o’clock. This is Cafe #2, unassuming and casual, where I meet my sister after her Pilates class (having got there early for some word slinging). My goto lunch here is a “chicken baguette”, which is so much more than it sounds! Lovely red bench to sprawl out on — me and my Green Bag. 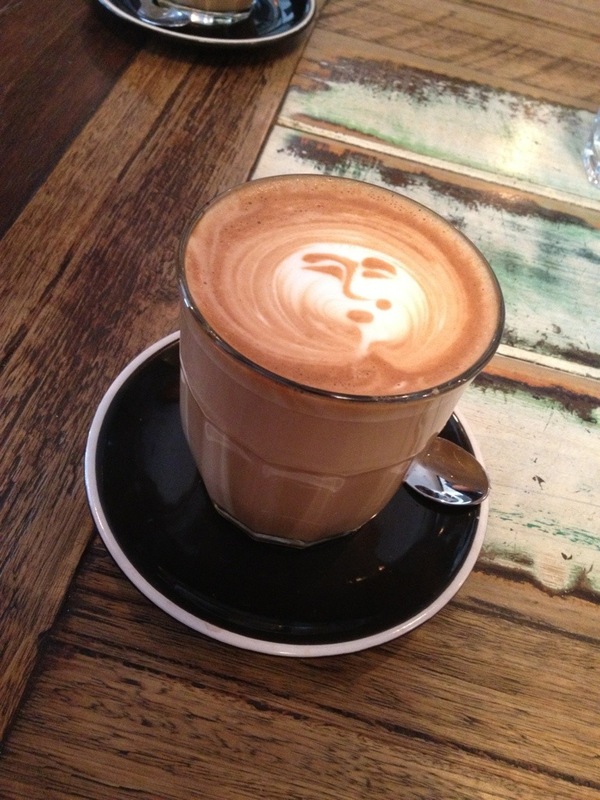 And finally this is Cafe #3, which has the best coffee in the street — with latte art to boot! Legendary latte (or flat white, in my case) art at this cafe. So there you have it. Now you have the full picture. When I talk about “writing in cafes” it’s invariably from one of these three. The staff at all three are coming to know me rather well. Now I’d love to hear about your favourite cafe. If you write in cafes, what are your criteria? NOTE: All photos taken by me on my iPhone 4S. I started this post off using the iPhone App, but for a post with this many photos it was too hard, so I edited and finished on the laptop. I love these pics! It’s nice to see the cafes you write in and it’s cool that you can walk to them. They are good creative spaces, although each very different. It’s fun to share them with you! It’s so cool to see your writing spots! I would totally join you in any of those places. The first cafe looks a lot like one of my two writing cafes. It also has wine and beer as well as these amazingly decadent crepes that you can get with all sorts of ingredients inside. It makes me hungry every time they make one because the smell wafts through the whole place. I can walk to it as well which is very handy. My drink of choice there? Hazelnut latte. Yum. Oh yummy, crepes! One of the great things about these cafes is they do all day breakfasts — so whether breakfast, brunch or lunch, I tend to have eggs of some description ~ along with my ‘large skinny flat white’ of course. Inspirational! Love your photos. I’m not a cafe writer, yet. Maybe I need to get out of the house because I’m having trouble focussing now. I’m currently at the point where I can ONLY write in cafes, because there are simply too many distractions at home. Probably something I need to work on! Those do look like some great places to write. I’d hang out there too, even if I don’t drink coffee or wine. I usually drink Zevia–or diet soda in places that don’t have it–and sometimes water. I’ve also been known to consume the occasional Mike’s Hard Lemonade or a strawberry daiquiri. Interesting – I’m not familiar with Zevia, but I rarely drink soft drink (what we call soda) at all. I’d prefer to just drink water all the time, but I dunno…I think I’d miss drinking something that has like a flavor and stuff. Thanks – it was nice of you to stop by. Thanks for sharing. I used to have a favorite cafe where I could sit all afternoon. 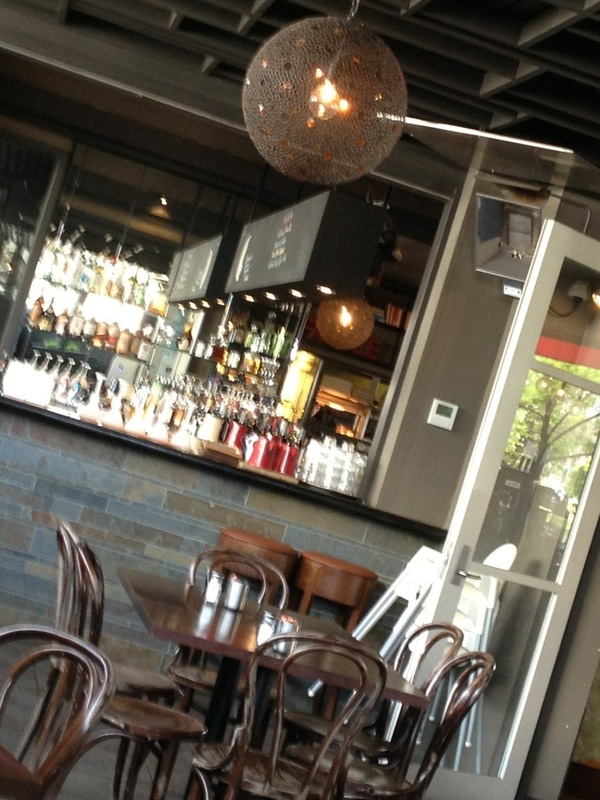 However, it converted/grew into more of a full service restaurant so it was no longer conducive to writing. I’m not a drinker of coffee and hate over-priced tea, plus I don’t need to be sitting in a place that supplies food all day. That’s why I’m still trying to find a place away from home to do writing. I think I need to get my rear in gear and haul my supplies to the library for a couple of hours two or three times a week. Love these photos! So fun to see the places you write. Yeah, it’s fun to share them. Thanks! I know I’m late to this little party, but better than never? 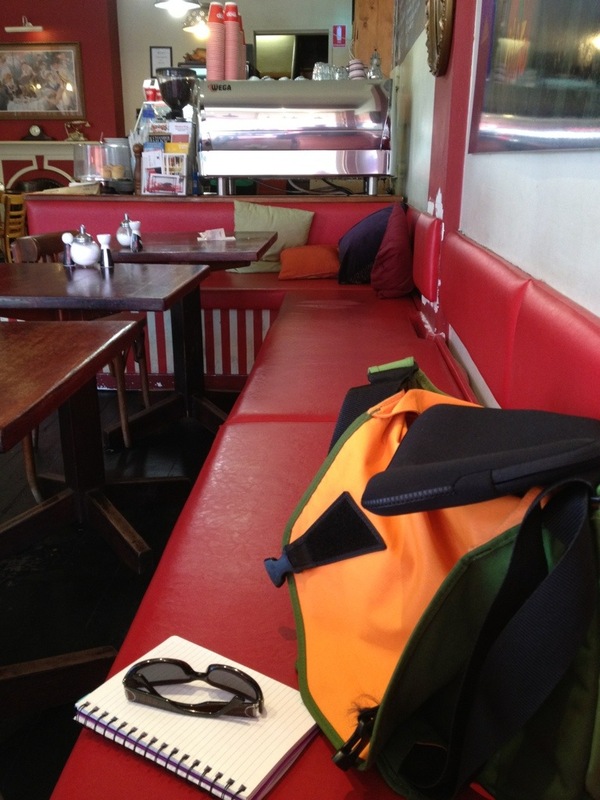 I tuck a mini moleskin into my handbag but that’s about as far as I get when it comes to writing in cafes. I get very guilty about occupying space after I’ve had my coffee and so usually leave fairly quickly. This probably says more about me than the expectations of the cafe staff. I will sometimes go to a park (with a bigger notebook – and there I will either have a lot of success or end up birdwatching. It’s the break that’s important I guess. 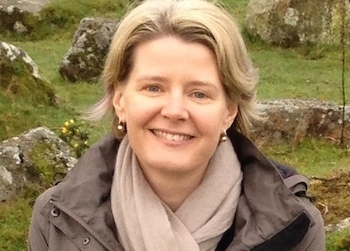 I like that way of seeing it – must go and test some out.